Anyway, recently I was tuning a SSRS report based on a SSAS cube for a customer. Looking at Profiler I could see a number of slow queries being executed, which was strange given that it was a fairly simple report. 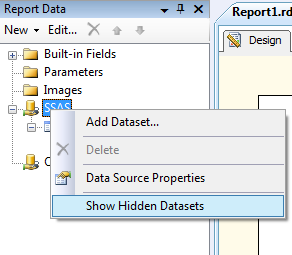 It turned out that during the design phase this report had had a number of parameters created in the SSAS query designer that had later been deleted; however, when you delete a parameter in the SSAS query designer BIDS does not delete the hidden dataset that it is bound to. What’s worse is that when an SSRS report is executed all dataset queries are also executed, even if the datasets aren’t used anywhere in the report, which means you get the overhead of running extra queries. It’s an easy mistake to make and in this case the execution of unused datasets was adding several seconds to the execution time of the report. And there’s more! 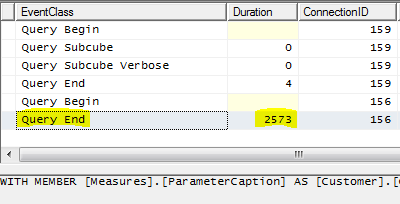 What I found really interesting about this parameter dataset query was how long it was taking to execute. In this example 2.5 seconds, even on a warm cache, seems like a very long time to me even though there are a lot of members on the Customer hierarchy. Once the report is deployed that goes down to a consistent 2.1 seconds, and when I run the same query through SQL Management Studio it goes down to 1.5 seconds. Why the difference in execution times? I’m not sure, but I suspect it’s a combination of the connection string properties used and the use of a flattened rowset. In any case, 1.5 seconds is still slow and it’s certainly not good if you actually do want to use a query like this in a dataset bound to a parameter. Incidentally, some of the more astute may be asking why I need to include MEASURES.DUMMY in the query above when I can use an empty set on the columns axis instead. 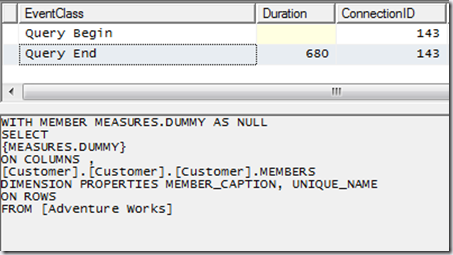 Two reasons: one, if you use an empty set on columns in the OLEDB connection you get no rows returned; two, I noticed when the query was being executed in SSRS a Query Subcube event was raised suggesting measure data was being requested from the cube – this didn’t happen when I ran the query in SQL Management Studio. I suspect both problems are something to with SSRS using a flattened rowset, so I’ll investigate and post back here when I get an answer. Your suggestion to delete unused datasets applies equally to SQL datasets. It appears that RS fires every dataset, whether they are used or not. They\’ve been saying that the integration will improve ever since I saw the first beta of SSRS back in, ohhhh, 2002 I think. I\’ll believe it when I see it! I second that one Chris. Slowly waiting for this integration to improve as well. Nice catch on the parameter dataset. Crazy. Thanks for sharing your tips. We are using SSRS 2005 Standard Edition (SP3). Yes, we\’re thinking the main dataset needs some tuning. This is where our issue lies. How do we determine where the issue is within the dataset? This is where we are \’stuck\’ and have been searching for answers.I write the reports (and new to it as well, not real familiar with MDX code), not the cube. The MDX query for the SSRS report is generated by SSRS. I do not believe I have any calculations in the query (if there are, then they were generated by SSRS). Our thought, here, is that all these calculations are in the cube. So we should, essentially, just be able to \’drag & drop\’ the dataset query onto the SSRS report for display. I\’d copy the SSRS generated code here, but I don\’t know if that\’s appropriate.I will forward your link you included to those here who build the cube to see if they can determine if the cacheing would help.Thanks and any other insight would be greatly appreciated. You can\’t avoid the autogeneration of hidden datasets, but you can delete them and change the parameters to use the datasets you create. Cant believe how badly SSRS and SSAS interact. Do the dev teams not like each other. I have gone down the route of trying to report from cubes and am having all sorts of problems. Excellent article btw, I am a noob to this the steps above really helped me troubleshoot a problem I had. Can you confirm that there is no “ALL Customers” in the list in te report? 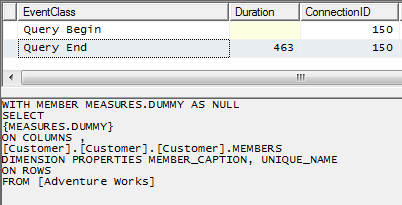 The query returns a All customer but I can’t see it in the parameter list. Which query are you talking about? Okay, Well it has something to do with the Calculated fields. These seems terrible slow. If I delete them, the report runs well. Yeah well, but the problem is how to get the “All Customers” in the Parameter of the Report or else you have to select every Customer record and pass that to the cube….Seems not a desirable option? No, that wouldn’t be good. I can’t test this, but if you don’t use a calculated field the query should just return a blank name for the All Member when SSRS runs it as a flattened rowset. Could you then accept the blank name instead of seeing “All Customers”? Now I ‘ve also the Customer Code and I thought I could pass this to the Subreport. But now I’ve the same error even passing the parameter to the dataset in the main report. brrrrrrr. frusti. Don’t know why I have this errror now in the main report. So, Getting a bit frustrated. I’m working with visual studio 2013 and SQL Server 2008 R2. I think I found another limitation of the OLEDB MDX Query: You can’t pass a variable to it. I thought that I could limit the number of customers by checking whether there is Sales in a particular week (also a parameter). 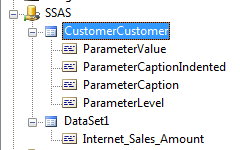 But SSRS is complaining that this (using a parameter) is not supported by the dataextension. So cascading parameters are also not possible with this solution. 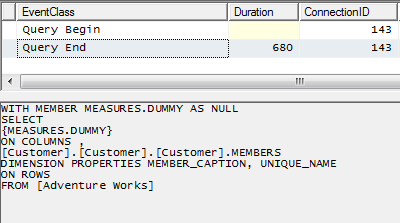 I was thinking to pass the selected list not as a MDX but as a Comma Separated Value with join and split. Because there is quite some overhead transferred to subreport: [Customer]. [Customername] every time. Succes not guaranteed. Well, I finally got a solution by passing the selected values to the subreport with CSV string with aid of join, replace and split. Not sure if anyone has experienced an issue with the Designer itself? Over a WAN the designer slows to a crawl when dragging a field to the Filters or selecting the drop down to select a member to filter by, even if the attribute only has a couple of members.